The holidays are right around the corner…and so is flu season. Autumn is the perfect time to start incorporating some healthy habits that can strengthen your immunity and nip the flu bug before it bites. One way to reduce your chances of catching the flu is to get a flu shot, but there are other measures you can take that may be effective in staying healthy this flu season. Take care of yourself. Eat a healthy, well-balanced diet and make exercise a part of your daily routine. Regular exercise keeps your immune system going strong. Drink plenty of fluids and get plenty of sleep. Stress weakens your immunity, so find healthy ways to manage stress and avoid people and situations that create a stressful environment. Be proactive in stopping the spread of germs. Make sure everyone in your family washes their hands frequently. Avoid sharing personal items such as food, eating utensils, clothing, linens, towels or even pens or pencils unless they are cleaned before use. Disinfect commonly touched objects or surfaces such as doorknobs, computers, telephones, door handles or switches. Minimize contact with or avoid other people who are sick. Likewise, keep your distance from other people when you are sick. Don’t go to work or school if you have flu symptoms, especially if you have a fever. Stay home until at least 24 hours after the fever has passed. You don’t want to spread the flu to your co-workers or classmates. 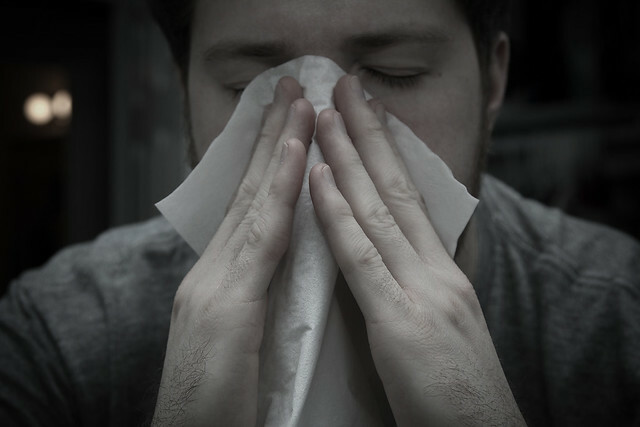 Cover your nose and mouth with a tissue when you cough or sneeze, or sneeze or cough into the crook of your elbow if you don’t have a tissue. Following these steps diligently will help keep the flu bug from putting a damper on your fall and winter festivities.